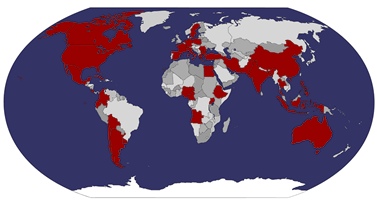 A month ago, I showed a little map of the world where our applicants come from. It turned out to be by far the most popular post of the last month, so here is the this month's update. We had students interested in studying with us from 26 countries at the beginning of the month. Now, we have applicants from 40. The US is the single biggest source of applications, followed by Italy, Germany, Canada, Spain, and India. At the same time, there are also some surprising white spots on the map -- we have no Russian, South African, UK, or Brazilian applicants as of yet. Nonetheless, as you can see, we are doing pretty well covering the globe... the range and quality of candidates is nothing short of astonishing, if I may say so (having been involved with applications to ITFD since 2007).